It is with great pride that I can announce to you that, based on our Patriot ancestor, Capt. Benjamin Gorton, our family line has been accepted into the Daughters of the American Revolution! In this world, I’m not too sure what “perpetuity” means, but assuming libraries continue to exist, our grandchildren and great-grandchildren and great great-grandchildren will always be able to trace their Gorton family line back to our Patriot. "Captain" Benjamin Gorton, 1725-1814, born in Massachusetts, and served in Rhode Island, was in the military during the years from 1762-1792.See his bio on the family tree website that I finally have up and running. In 1952, a previous applicant from Woonsocket, Rhode Island, had done the hardest part of the research which is proving that our ancestor actually served in some capacity during the American Revolution. "...Any woman is eligible for membership...who is lineally descended from a man or woman who, with unfailing loyalty to the cause of American Independence, served as a sailor, or as a soldier or civil officer...or as a recognized patriot, or rendered material aid thereto..."
and the births of my children. Not so easy a task, if you start to think about it. Do you know where your birth certificate is? But it was a a fun challenge. The hardest document to find was Mary Augusta Gorton's death because I didn't know when she died or where she died. To find a record you need a name, a place and a date. 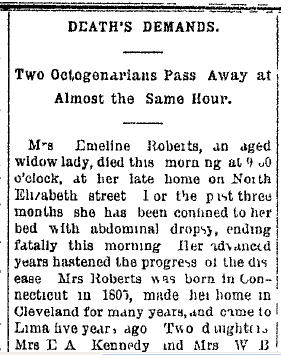 All I had was her name, Ohio (possibly Lima, Ohio) and "died about age 63." There were many Mary A. Myers, in many places in Ohio in many years! I finally had to write to the Woodlawn Cemetery in Lima, Ohio, guessing they might have a death record...which they did! Then with the actual death date, I could write for her death certificate. To get a record costs about $20, so you have to be pretty sure you're sending for the right one before you stick the stamp on the envelope. If anyone wants to join D.A.R. in the future, most of the work is done. All you have to do is document your own records and your parents. And men, don't feel left out. 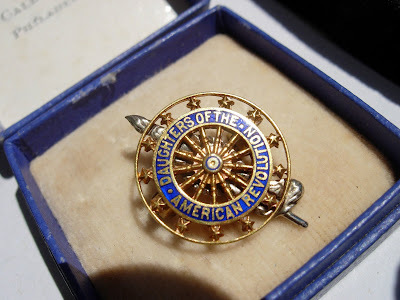 You can join the S.A.R., Sons of the American Revolution. D.A.R. 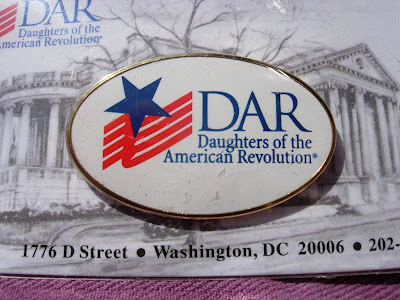 wasn't formed until 1890, in Washington, D.C. and I read one account that said it was formed in response to women not being allowed to join the all-male descendants of patriots group that existed in their day. The first feminists! Who are the people in these photos? From our dear Aunt Pat, via Ryn and via Barb, have come some new family photos. Knowing that on the back of them there are no names, I find myself thinking there should be a law that requires people to write a caption in pencil on the back (lightly on the edge...) for every photo taken. But since there were no captions, I have been trying to figure out who these people are. Would you be interested in my conclusions? It's amazing what you can deduce from a photo without knowing anything about it, just by studying it for a long time. Little details that you don't notice at first begin to come into your awareness after you stare at the photo for a while. [There are only a few women on the family tree who were alive in 1880-1900, the time of this photo. The lady in the photo is too old to be Mary Augusta Gorton, Grandmother's mother. (Mary Augusta was 40 in 1890, not 70). The lady in the photo has a thin face so she can't be Francis Lucinda Roberts, who has a very round face. (See photo in Geneablog #1). She looks a bit too young to be John Charles Gates' mother, Sibylla Steffler Goetz, who was born abt 1814, and would be about 76 in 1890. That she has glasses on makes me think of Mary Augusta Gorton and her mother, Frances Lucinda Roberts, who both wore glasses, and since eyesight is often hereditary, maybe this is Emaline Hotchkiss, (Frances Lucinda's mother...)? But Emaline was born in 1805 and she died in 1890 at age 85 So it's probably not her. Barbara Hemerling was alive in 1900 (was on the 1900 census) and she was about 70 years old then. She and her second husband, Andrew Meyers, lived with her daughter, Elizabeth, and with Elizabeth's husband, John Charles Gates and their 8 children, second youngest being Augustus Joseph Francis Gates. Because Barbara lived with Elizabeth, Barbara's photo would have likely been passed down to her daughter, Elizabeth, and then to her daughter's children, A.J. Gates being one and then it went to Aunt Pat, the youngest in the family. Who is the baby? The photo is around 1880-1890. If you study the baby's face, you may be reminded of someone else who has very petite lips and who tilts her head for all her photos. I'm fairly sure that this photo is of Grandmother, Frances Lenore Myers, around 1889, about age 2. The first clue is that in the front right-hand corner of the photo, it says "Lima, Ohio." (I didn't see that until I had studied the photo several different times.) Lima is where Grandmother was born. The caption of the second photo, also with "Lima, Ohio" printed on the front, says, "My little girl at six months," in handwriting "that looks like grandmother's," says Ryn and Barb. 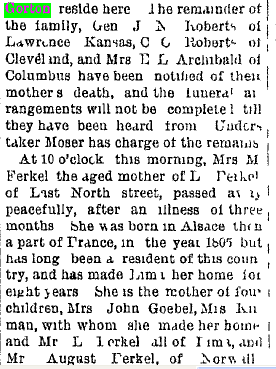 Grandmother is the only girl in the family of Myers children born in Lima, Ohio. I have seen Mary Augusta's handwriting in inscriptions in books given to Grandmother, and their handwriting is almost exactly the same. (And like my mother's). So the 6 month-old baby must be Grandmother herself again. And who are these lovely ladies below? The first tinted image is Elizabeth LaSalle at about age 16-20, in abt. 1865 to 1869. (I know this from a captioned! photo that Connie gave to all her children.) Barb said the original photo was on a piece of porcelain. Elizabeth has on her best New Orleans style dress, reminiscent of the Civil war styles(1865), like in Gone with the Wind. Could this be her coming out party at age 16? Perhaps her wedding? It seems to be more of a ball gown than a wedding dress to me. She gets married to John Charles Gates at age 20, in 1870. Does she look 16? or 20? I think 16. 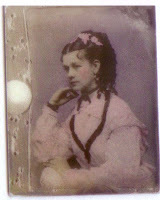 Next, who is the lady in black on a tintype? Tintypes were invented in 1856 and in mass use by 1870 or earlier. I think she looks like Elizabeth LaSalle again, more around the age of 20 or so. She's got that same hair style, parted in the middle with a similar little curl coming down on the forehead and she seems to have the same nose. What do you think? Uncle Bill, do you have any memory of the first photo at the top being referred to as Grandma Gates' mother, Barbara Hemerling? Maybe you remember one of those sessions where the older people take out the photos and spread them out on the table and point out who was who and the younger people look at the photos on the table and say, "who is that again?" If only they had written something, anything, on the back of the photos. So, cousins, remember, if you don't want your grandchildren to be wondering whether to throw those pictures out or not, write captions on your photos! Thanks Ryn and Barb (and Aunt Pat) for the pictures.